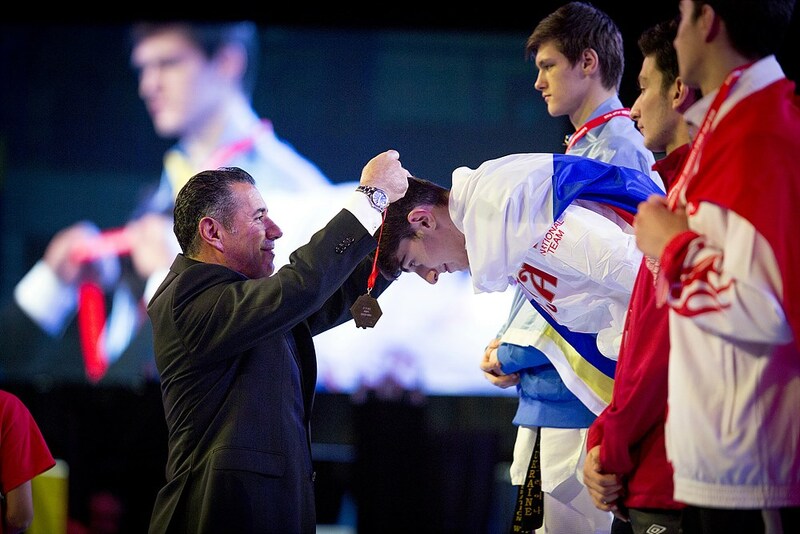 BURNABY, Canada (Nov. 19, 2016) – Russia, Turkey, Korea and host country Canada all struck gold on the penultimate day of the five-day 2016 World Taekwondo Junior Championships. Medals were up for grabs in the female -59kg, male -68kg, female -63kg and male -73kg categories in Burnaby’s Bill Copeland Sports Center. On Day 4, the cheerleading was in full swing, with many teams having appropriated the chant pioneered by Chinese Taipei and altered for their own purposes: “Let’s go (add nation here) – let’s go!” Many had also got hold of thundersticks, or were using kicking paddles for the same effect. Once the matches got underway, “noisy” just does not describe it. Almost at the opening bell, the hometown girl went one up with a body kick, prompting a fierce firefight as Yeh fought back. But it was Park who extended her lead to 2-0, then 3-0 – the last with a thwacking round kick to the body that drew cheers. Some messy clinchwork followed before regular action resumed. Both girls then fired a series of head shots. The Taiwanese coach video appealed a head shot – to no avail. The round ended 3-0 to Park. In the second, Park again wasted no time, scoring with a fast head kick – then another – before tumbling to the mats after Yeh connected with a head kick of her own, and the board surged to 12-3. But the Taiwanese lass was still in the fight. She counterattacked, but it was the Canadian fighter who landed yet another head kick. By now, she was looking very, very dominant. 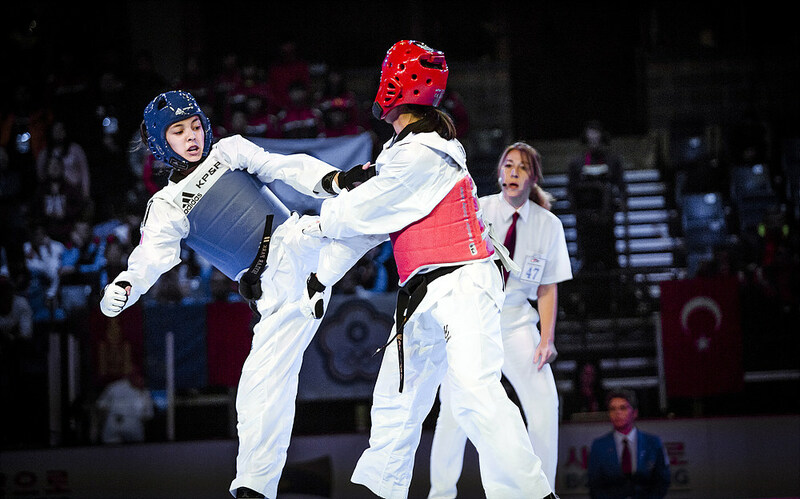 A break in the torrid action was called, with the bout at 15-4 as Park’s torso armour was re-secured. Park landed a picture-perfect side kick that did not register on the PSS, then was forced out of the ring. Both girls clinched and then fired head kicks, the two fighters’ techniques almost cancelling each other out. Park’s technical mastery and excellence of technique were evident – she scored with a side kick from the extreme close range. The round ended 16-5. As the bell rang on round three, Yeh had everything to fight for. Both girls were now fighting using the entire ring, Park again unleashing a textbook side kick. Yeh landed an out-of-nowhere head kick, raising her score to 8-16. There was a brief slowdown – the prior tempo had been too fast – then Park’s cut kicks scored again for 17-8. By now, Yeh was looking desperate. She hopped across the floor, flicking our leading leg on the high line, hunting Park’s head; the Canadian did well to evade. Then – suddenly – it was all over: The Canadian impacted with a head kick that gave her the victory on a 20-8 point difference. She bowed to the crowd, hugged her coach/dad, then dashed to the stands, grabbed a national flag and stormed back onto the stage – where a duo of beaming Mounties, in full dress uniform, joined her for an impromptu (and unscheduled) victory celebration. 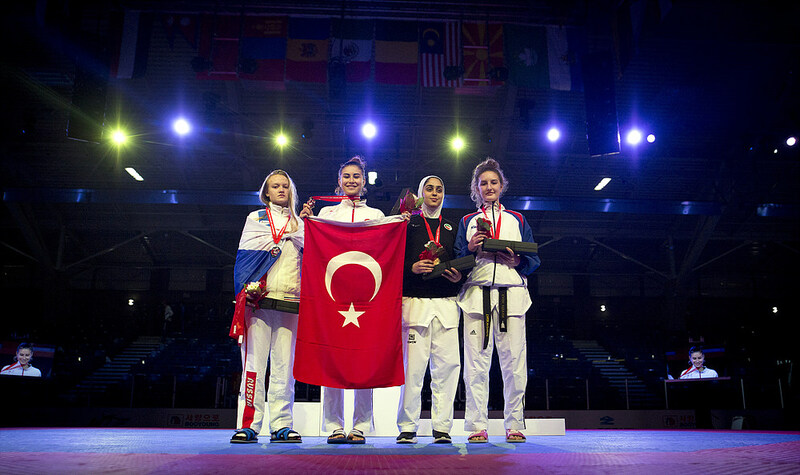 Yeh took silver, while Elizaveta Federova of Russia and Aysenur Ozcan of Turkey won bronzes. 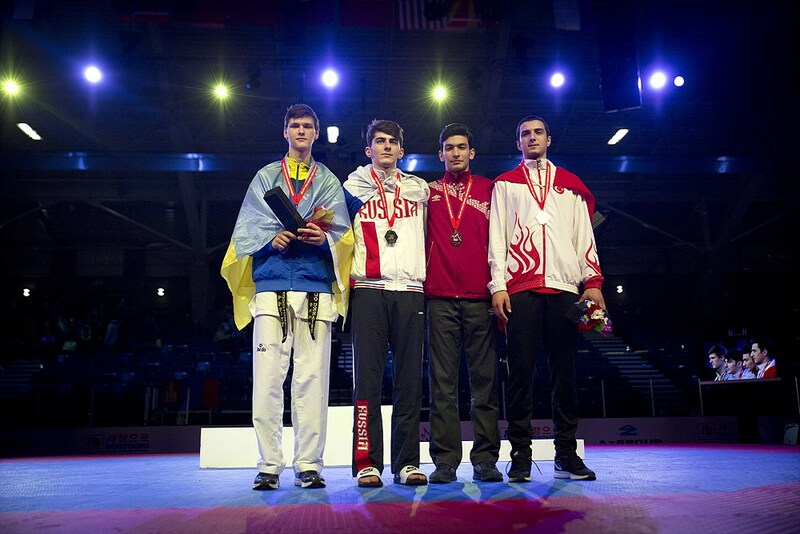 The finals of the male -68kg saw the impressive Kostiantyn Kostenevych of Ukraine, who had won his semi-final match by 12-point difference, take on Sarmat Tcacoev of Russia. The first round started fast, with both lads probing with kicks high and low, while the Russian and Ukrainian supporters roared from opposite sides of the stands. Both scored almost simultaneously – a body kick and a punch – to go 1-1. The two then scored again in a flurry of shots; the round ended 6-5 to Tcacoev. The second started at similarly high speed, the Russian scoring with a big overhand punch to go 7-5 up, then, in a fierce duel of multiple techniques, extended his score to 9-5. Kostenevych hit back, taking his points to 8-9, prosecuting attacks with real determination and not taking a step back. The Russian coach asked for a video replay: Denied. But immediately after the break, Tcacoev struck with a beautiful step side kick to the body, taking the board to 10-9 in his favor. In Round 3, the match’s seesaw quality continued, as the Ukrainian returned fire to take the board to 11-11. With just over a minute remaining, Kostenevych seized the lead, going 12-11 up with a cut kick to the body – but not for long as Tcacoev evened the score to 12-12. The Ukrainian stumbled and it was 13-12. Just half a minute remained. The Russian scored again to the body, going 14-12 up, then 15-12 up. And that was it. The high score was a fitting end to a very tight, hard-fought bout. In recent elite-level international competitions, unlucky Russia has all too often been an also-ran – consistently winning silvers and bronzes, but not golds. Tonight Tcacoev delivered the long-awaited gold. 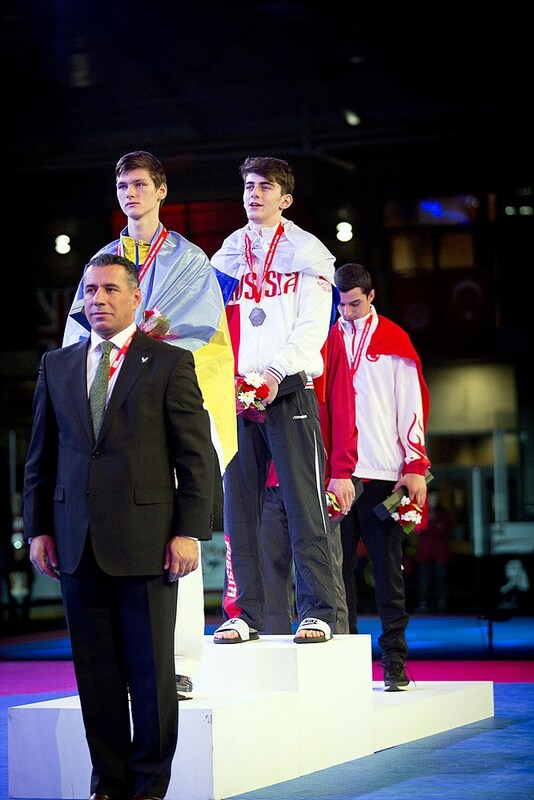 And Kostenevych had nothing to be ashamed of, taking silver in a very close fight that could have gone either way. In the female -63kg final, Seyma Sogut of Turkey did battle with Margarita Blizniakova of Russia. In common with the fast pace of earlier matches, the Turk scored almost immediately with an arcing ax to the head for 3-0. Blizniakova returned fire with a body kick, winning one point. A video replay request was denied to the Turk. Both dueled fiercely before the Turk raised her leg and not so much kicked as planted it squarely on Sogut’s face, going 6-1 up. 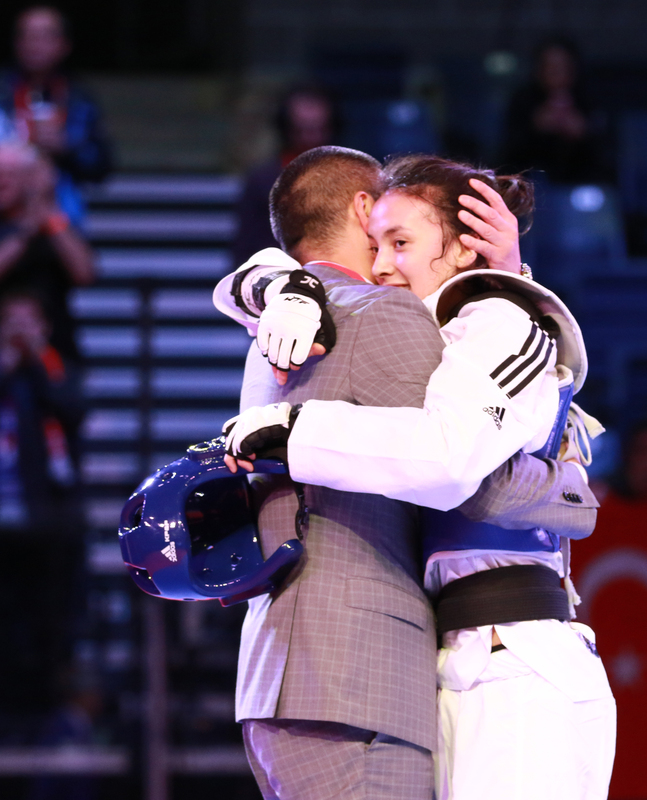 The Russian fought back but Sogut blocked a powerful arcing kick to her head, ending the round 6-1. The second round was a change of pace, featuring largely desultory attacks – though the Russian clawed back a single point to 2-6. It was almost as if both fighters were saving up for the third and final round . The second ended 6-2 to Sogut. In the third, the taller Turk stood fast, letting the Russian attack her and not giving an inch. Blizniakova kicks just not make the height against her taller opponent. Then, in a flurry of techniques, the Russian lost her head gear. Sogut landed another head kick; then, within seconds, another, the yet another head kick, all in the space of seconds. five seconds For the second match of the evening, a final had ended on point difference, 16-2. In tears, the Turk stood to attention, saluted her crowd in the stands. 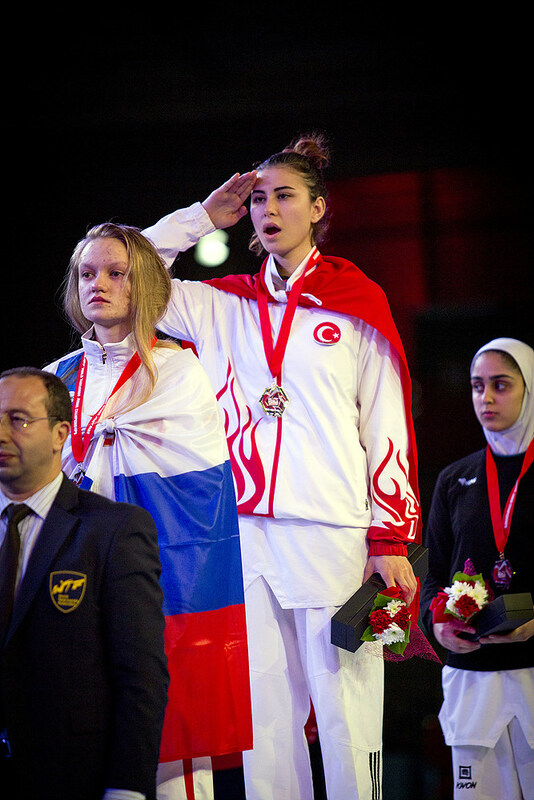 Blizniakova took silver, while Nadja Savkovic of Serbia and Parisia Javadi Kouchaksarei of Iran won bronzes. 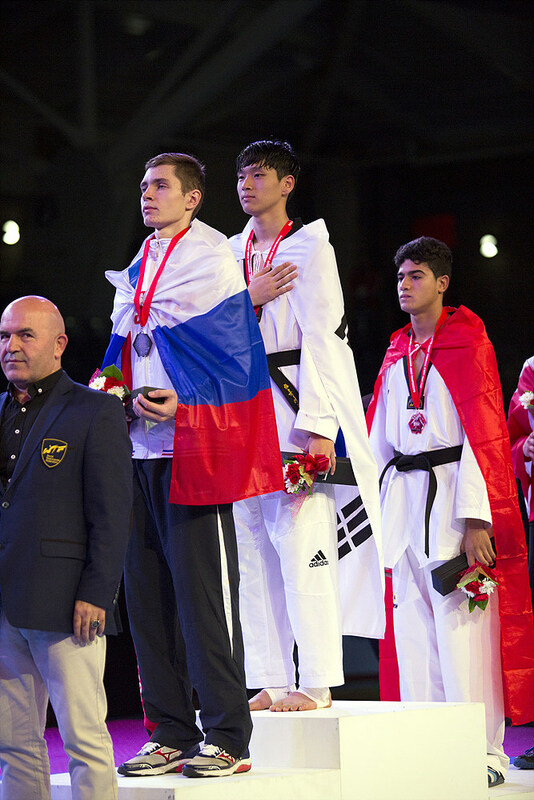 The finals in the male -73kg class pitted Seung-min Lee of Korea, who had won his semi-final match on point gap, against Sergey Karnuta of Russia – who had also won his semi-final on point gap. All fights tonight had started fast with the athletes not bothering with probing attacks but going straight for the kill. And so it proved again. Lee scored 3-0 almost immediately, but Karnuta responded fast with a kick to the body for one point. The match then degenerated into messy clinching. The Russian was trying to score with side kicks, but the Korean scored with a crescent kick to the head in the clinch, going up 6-1. But as action resumed, the Russian manoeuvered the Korean to the edge of the mats and landed his own arcing head kick. Round 1 ended 6-4 to Lee. In the second, the two clinched again with Lee trying to land his trademark crescent kick at ultra-close range. This was the pattern of the fight: Clearly the Russian had the advantage at range, Lee up close. Karnuta raised his score to 5-6 with around kick to Lee’s body. Keeping his knee high and threating with his round kick, he forced Lee to back pedal – but in the clinch, Lee yet again landed his crescent kick to the rear of the Russian’s headguard. The second ended 12-8 to Lee. In Round 3. Lee raised his points to 13-8, but then the Russian landed to the head, lifting his points to 11. The pattern continued: Karnuta forced Lee back, Lee went to the clinch. Although both lads were looking tired, the Korean – yet again – landed a crescent kick in the clinch, taking the scoreboard to 16-11. The Russian crowd were by now audibly unhappy at Lee’s unsatisfying style. Karnuta, though tired, was still fighting back, taking his score up to 15, then to 16 – and once again the Korean drew ahead to 19 points when he needed to, via yet another crescent kick in the clinch; the Russian just seemed unable to deal with this tactic. And more, the trailing Russian fought back raising his score to 17. The pace was visibly slowing, with both looking exhausted. 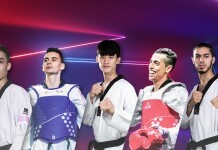 With just ten seconds remaining, the Russian upped his pace and actually grabbing the lead but – just when he needed it – the Korean scored with a head kick. Despite a last-second video-replay request from the Russian coach – denied – he took the match and the gold, 22-21. Lee had showcased a messy but effective style and had demonstrated a clear ability to win points just when he needed them. 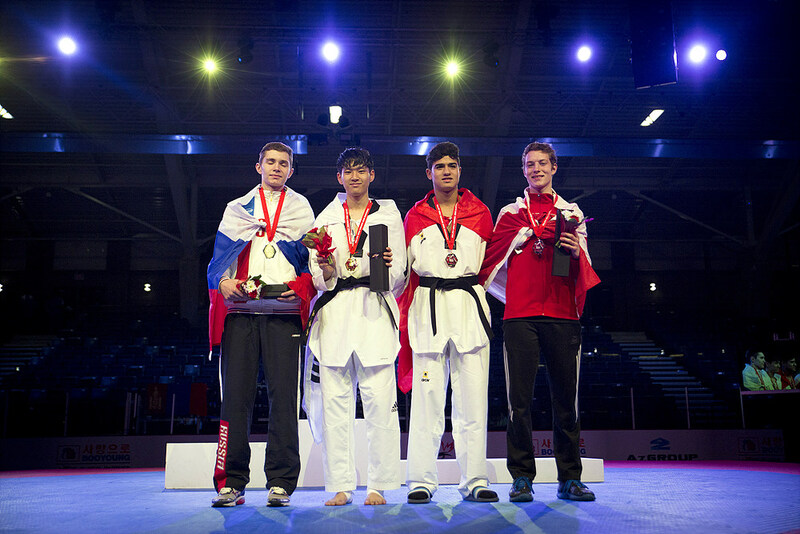 Karnuta, meanwhile, had fought well and deserved every ounce of his silver medal after a very exciting match. 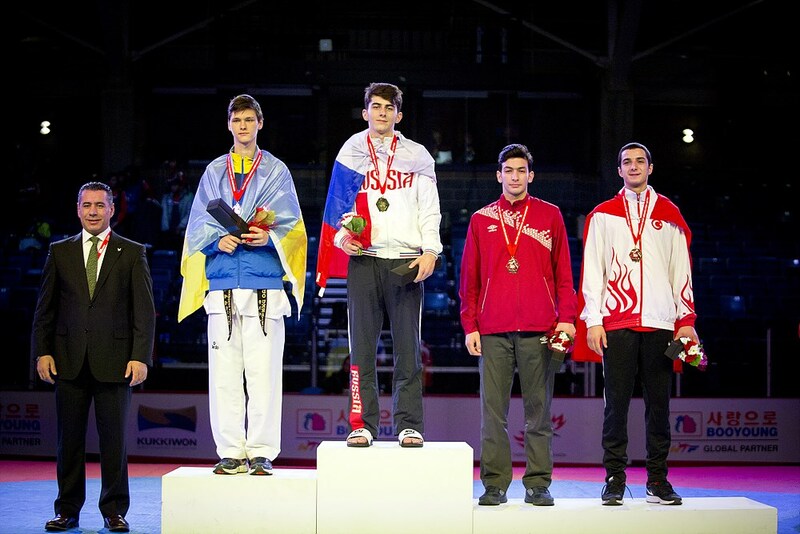 Bronzes went to Zachary Hiebert of Canada and Ayoub El Yaqini of Morocco. Action resumes in the Bill Copeland Sports Center on Day 5, the last day of the championships, tomorrow. *More photos of Day 4 will be updated soon.